The College of Liberal Arts for Women was founded and admitted women students only. For the first time in Penn’s history, women were offered a full-time, four-year, liberal arts, undergraduate degree program. It should be noted, however, that the standing faculty of the College for Women did not include any women. At the Commencement held on 20 June, the University awarded the degree of Bachelor of Arts in the College of Liberal Arts for Women to nine women: Eleanor Doris Boerner, Anne Price Paxton Edmunds, Mary Ann Fees, Sidney Clymer Frick, Dorothy Handloff, Ruth Lenore Schindler, Ruth Bertha Elise Schmidt, Catharine Mary Sigafoos, and Florence Joan Weiss. They were the first graduates of the College of Liberal Arts for Women. In 1995 the University honored one of these nine – Ruth Schindler Bocour – by naming her a member of the Trustees’ Council of Penn Women. In May, Penn established a women’s section of the Delta Chapter of Phi Beta Kappa, the national academic honor society. The Delta Chapter was established at Penn in 1892, but its membership was open only to men. The women’s section had its own organization and officers. The first members of the women’s section of the Delta Chapter were Marion Melvina Astley, Alice Patchin Ake Holmes, Margaret Anne Kateley, Marion Grace Miller, Sara Elizabeth Pepper, Erma Renninger, and Susan Foulke Yocum. All seven earned the degree of Bachelor of Arts in the College for Women in 1935. In addition, at the May 1935 inaugural ceremonies for the women’s section, one alumna, Ruth Bertha Elise Schmidt (A.B., College for Women, 1934) was also elected to membership. 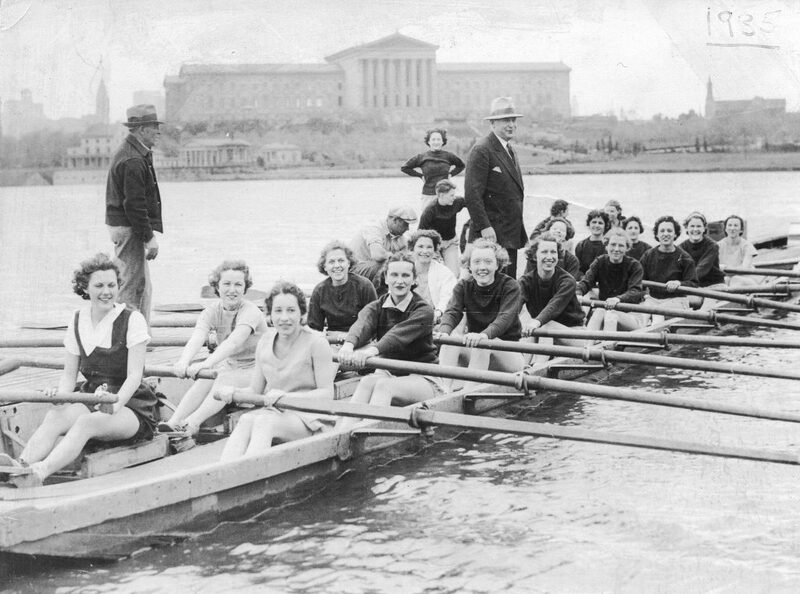 The first officers of the Penn women’s Phi Beta Kappa organization were Ada Heilner Haeseler Lewis (A.M. in History, 1922; in 1942, an Associate Trustee of the University) (“Mrs. John F. Lewis, Jr.”), President; Anne Bezanson (Phi Beta Kappa at Radcliffe College; Research Professor in Industry in the Graduate School of Arts and Sciences), Vice-President; and Virginia Kinsman Henderson (B.S. in Ed., 1930; A.M. in Psychology, 1936; Personnel Officer in the College for Women), Secretary-Treasurer. The Pennsylvania School of Social Work was affiliated with the University of Pennsylvania as a graduate professional school. The Pennsylvania School had been founded in 1909 and was well established as autonomous institution of higher education. Its Trustees, in the year of affiliation with Penn, included seven women: Helen Safford Knowles Bonnell (“Mrs. Henry H. Bonnell”), Harriet Frazier Zimmermann Caner (“Mrs. Gerald W. Caner”), Helen Derr Harbison, Ruth Mildred Ingeborg Karlson (B.S. in Ed., 1929; M.S.W., 1938), Mrs. I. Albert Liveright, Marion Clark Madeira (“Mrs. Louis C. Madeira”), and Helen Foss Wood (“Mrs. George Bacon Wood”). These seven were the first women to serve the University as overseers of the School of Social Work. The Pennsylvania School of Social Work offered the professional degree of Master of Social Work. In its first year, the School of Social Work brought five women to the standing faculty – Virginia Pollard Robinson (Ph.D. in Sociology, 1931), Professor of Social Case Work; Jessie Taft, Ph.D., Associate Professor of Social Case Work; Isabel Gordon Carter, Ph.D., Assistant Professor of Social Research; and Goldie Basch, B.A., B.S. and Rosa Lee Wessel, B.A., Assistant Professors of Social Case Work – and 186 women to the student body. The School of Social Work became a full professional school of the University in 1948 and beginning in 1949 offered the research and teaching degree of Doctor of Social Work. The School of Education established a Department of Nursing Education and offered graduates of the diploma schools of nursing an undergraduate, professional degree in education. This advanced course was designed to prepare graduate nurses for positions in hospitals, schools of nursing, and public health nursing agencies. The establishment of the Department of Nursing Education in the School of Education is generally regarded as the founding of the modern School of Nursing at Penn. In 1935 the School of Education appointed two full Professors to the Department of Nursing Education: Katherine Tucker, R.N., A.B., and C. Ruth Bower, R.N., M.S., Sc.D. They were the first women to be awarded tenure in the School of Education and the first to hold senior professorships in that School. Professor Tucker was appointed Director of the Department of Nursing Education. Professor Bower moved to the School of Nursing, when it was established in 1950, and continued to serve as Professor of Nursing Education until her retirement in 1955. The University appointed her Emeritus Professor of Nursing Education, effective 1 July 1955. At the Commencement held on 10 June, the University awarded the degree of Bachelor of Architecture to Betty Ray Bernheimer and Halina Leszczynska. They were the first women to be awarded the B. Arch. degree at Penn. Also at the Commencement of June 1936, the University awarded the degree of Master of Social Work to thirty-nine women graduates of the Pennsylvania School of Social Work. They were the first women to earn the M.S.W. degree at Penn. The School of Education acquired the Illman Training School for Kindergarten and Primary Teachers. The Illman School brought two women to the faculty – Adelaide Thomas Illman (B.S. in Ed., 1929), A.M., Professor of Education and Florence E. Thorp, Assistant Professor of Kindergarten Education. They were the first two women to join the School of Education as standing faculty in the academic discipline of education (as opposed to another discipline – Nursing – or a vocation – Home Economics). Adelaide Illman was the first woman to be awarded tenure in the academic discipline of education and the first woman to hold a senior professorship in that discipline. Althea Stauffer Kratz Hottel (B.S. in Ed., 1929, A.M. in Sociology, 1934, Ph.D. in Sociology, 1940, Hon. LL.D., 1959), though just seven years out of college, was named Directress of Women. At the Commencement held on 9 June, the University awarded the degree of Bachelor of Architecture to Georgina Pope Yeatman (A.B., 1922), as of the Year 1925; to Doris Joy Derbyshire, as of the Year 1929, and to Hannah Benner Roach, as of the Year 1935. These three were therefore recognized as the first women to complete the course for the B. Arch. degree at Penn, even though not the first women to be awarded the degree itself. Georgina Pope Yeatman, one of the founders of the Women’s Athletic Association (see above, entry for 1921), was a student in School of Fine Arts’ architecture course for two years, from 1922 through 1924. Though academically qualified, she was denied a degree by the faculty of the SFA. She enrolled in Massachusetts Institute of Technology in 1924 and earned the degree of B.S. in Architecture from MIT in 1925. In 1929 she became the first woman to practice architecture in Philadelphia and in 1936 she became the City of Philadelphia’s first woman Director of Architecture. At the Commencement held on 15 June, the University awarded the degree of Doctor of Veterinary Medicine to Mary Josephine Deubler. She was the first woman to earn the V.M.D. degree at Penn. At the Commencement held on 11 June, the University awarded the School of Fine Arts’ degree of Bachelor of Applied Arts to Antoinette Bremner Walker. She was the first woman to earn the B.A.A. degree at Penn. Also at the Commencement of 1941, the University awarded the School of Medicine’s degree of Master of Public Health to Ruth Hartley Weaver, M.D. and Dorothy Donnelly Wood. They were the first women to earn the M.P.H. degree at Penn. Dr. Weaver, a 1917 graduate of the Women’s Medical College of Pennsylvania, was Assistant Director of the Philadelphia Department of Public Health. In 1960 she would become Director of Medical Services for the Philadelphia Board of Education. At the Commencement held on 2 June, the University awarded the degree of Master of Fine Arts to Christine Monaghan Sosna (B.F.A., 1939). She was the first woman to earn the M.F.A. degree at Penn. Althea Kratz Hottel was appointed Dean of Women, the first woman at Penn to hold the title of Dean. At the Commencement held on 2 June, the University awarded the degree of Master of Architecture to Christine Alice Fahringer (B. Arch., 1941). She was the first woman to earn the M. Arch. degree at Penn. At the Commencement held on 4 March, the University awarded the degree of the Fels Institute for Local and State Government, the Master of Governmental Administration, to Eleanor Elizabeth Achterman and Martha Ring (B.A., 1942). They were the first women to earn the M.G.A. degree at Penn. In June a “School” of Nursing was established and the University announced a five-year course leading to the Bachelor of Science in Nursing. During the first two years the student was enrolled in the College of Liberal Arts for Women, “for a program of pre-professional courses.” Then the student entered the regular three-year course of the School of Nursing of the Hospital of the University of Pennsylvania. In this way the University offered the degree of Bachelor of Science in Nursing, but without establishing a faculty of nursing with its own dean. In addition, the hybrid curriculum of liberal arts classes and the traditional, three-year, nurses’ training program did not provide its graduates with a mastery of the academic discipline or a set of professional skills superior to that of the graduates of the HUP School of Nursing. The five-year course was considered a “basic curriculum” in contrast to the “advanced curriculum” taught in the School of Education. At the Commencement held on 1 July, the University awarded diplomas in Nursing to twenty-nine women graduates of the Hospital of the University of Pennsylvania School of Nursing. This was the first class of the HUP School of Nursing to be recognized by the University at its Commencement. The Hillel Foundation was established in this year at 3613 Locust Street. Wilma Frances Korn (B.S. in Ed., June 1945) was the first President of the Hillel Foundation. Hillel was the successor to the Louis Marshall Society as the Jewish student organization at Penn. The Louis Marshall Society had been established in 1938; the men’s undergraduate yearbook for 1938 described the Marshall Society as follows, “the religious and cultural organization of the Jewish students at the University. The Society is an outgrowth of the former Jewish Students’ Association.” Wilma Korn was President of the Louis Marchall Society when it changed its name to the Hillel Foundation. The Jewish Students’ Association had been organized in 1924 by the Philadelphia Branch of the United Synagogue of America. It had occupied the “Jewish Students’ House” at 3613 Locust Street since the mid 1920s, where it served as a dormitory, Kosher dining room, and a social center for Jewish students. No woman is known to have served as President of the Jewish Students’ Society. The Hillel Foundation moved to 202 South 36th Street in May 1946. It is scheduled to move again in 2002 to a new building near 39th and Walnut Streets. At the Commencement held on 18 June, the University awarded the Graduate School of Medicine’s degree of Master of Medical Science to Helen Octavia Dickens. She was the first African American woman to earn the M.Sc. (Med.) degree at Penn. Also in June, the Trustees established the Constituent Board of Education for Social Work. It was the ninth Constituent Board created by the Trustees. One month later, the Trustees elected Helen Derr Harbison and Martha Rosenthal Wolf (B.S. in Ed., 1927) (“Mrs. Howard A. Wolf”) Associate Trustees of the University and appointed them members of the Board of Education for Social Work. Also in June, the Trustees elected Ada Haeseler Lewis (A.M., 1922) (“Mrs. John F. Lewis, Jr.”) an Associate Trustee of the University with membership on the Board of Liberal Arts, which had oversight of the College (for men), the College for Women and the College of General Studies. Mrs. Lewis was the first woman to serve the University as a member of the Constituent Board of Liberal Arts. The Graduate School of Medicine appointed Mary Hoskins Easby, A.B., M.D., to the faculty position to Assistant Professor of Cardiology in the Department of Medicine. She was the first woman to join the standing faculty in the Graduate School of Medicine. The School of Veterinary Medicine appointed Mary Josephine Deubler (D.V.M. 1938, M.S. 1941, Ph.D. 1944) to the faculty position of Assistant Professor of Veterinary Pathology. She was the first woman to join the standing faculty in that School. At the Commencement held on 28 February, the University awarded the School of Education’s degree of Doctor of Education to Elizabeth K. Porter (M.S., 1936). She was the first woman to earn the Ed. D. degree at Penn. The School of Fine Arts appointed Joyce Michell, Ph.D., to the faculty position of Associate Professor of Music and the academic administrative position of Chair of the Department of Music in the School of Fine Arts. She is the first woman to join the standing faculty in the School of Fine Arts and the first to earn tenure in that School. The Wharton School appointed graduate student Elizabeth Wallace to the faculty position of Instructor in the Department of Finance. She was the first woman to serve as an officer of instruction in that School. The College of Arts and Sciences appointed Elizabeth Farquhar Flower (A.M. 1936, Ph.D. 1939) to the faculty position of Assistant Professor of Philosophy. She was the first woman to join the standing faculty in the College of Arts and Sciences. In 1956 she was promoted to Associate Professor and became the first women to earn tenure in the College of Arts and Sciences. In June, the Trustees elected Sarah Logan Wister Starr (Hon. A.M., 1941) an Associate Trustee of the University with membership on the Board of Libraries. Sarah Starr was the first woman to serve the University as a member of the Board of Libraries and the third woman to serve with oversight responsibilities for the University Libraries. At the Commencement held on 26 August, the University awarded the Bachelor of Science in Nursing degree to Mary Ellen Booker, Wanda Wynelle Shellhouse, Idella Swartz Snavely, and Betty Becherer Wohlwend. They were the first women to earn the B.S. in N. degree at Penn. The Wharton School appointed Dorothy Swaine Thomas, Ph.D., to the faculty position of Professor of Sociology. She was the first woman to join the standing faculty in the Wharton School and the first to hold a senior professorship in that School. The General Alumni Society awarded its highest honor, the Alumni Award of Merit, to Laura Ruth Murray Klein (B.S. in Ed., 1931; A.M. in English, 1933; Ph.D. in English, 1943). She had served the University as National President of the Association of Alumnae, from 1943 to 1946 and as a founder and chairperson of the Alumnae for Annual Giving, from 1944 through 1948. She was the first woman recipient of the Alumni Award of Merit. In July the basic and advanced degree programs in nursing combined to form the modern School of Nursing and the degrees of Bachelor of Science in Nursing and Bachelor of Science in Nursing Education consolidated under the new School. Theresa Inez Lynch, R.N., A.M., Ed.D., was appointed Professor of Nursing and Dean of the School. She was the first woman to be appointed an academic Dean at Penn. Prior to this appointment she had held the academic administrator position of Directress of Nurses at the Hospital of the University of Pennsylvania since 1942 and had subsequently succeeded Katherine Tucker as Director of the Department of Nursing Education in the School of Education. The School also appointed four other women to the standing faculty: C. Ruth Bower, R.N., M.S., Sc.D., Professor of Nursing Education; Adaline Chase, R.N., B.A., M.A., the Helene Fuld Associate Professor of Nursing Education; R. Mildred Hall, R.N., B.S., M.P.H., Assistant Professor of Nursing Education in Public Health Nursing; and Helen Edgecombe Hess, R.N., B.S., M. Litt., Assistant Professor of Nursing Education. The School of Auxiliary Medical Services was established and offered undergraduate, professional degrees of Bachelor of Science in Occupational Therapy and Bachelor of Science in Physical Therapy. The School appointed Helen Smith Willard, B.A., O.T.R., to the faculty position of Professor of Occupational Therapy and to the academic administrative position of Director of the Philadelphia School of Occupational Therapy. The School appointed Dorothy E. Baethke, B.S., A.R.P.T., to the faculty position of Professor of Physical Therapy and the academic administrative position of Director of the Division of Physical Therapy. The School also appointed three other women to the standing faculty: Clare Spencer Spackman (B.S. in Ed., 1941, M.S. in Ed., 1942), O.T.R., was Associate Professor of Occupational Therapy; Eleanor Jane Carlin, B.S. (M.S. in Ed., 1947), A.R.P.T., Assistant Professor of Physical Therapy; and Eleanor Kyle, B.A., O.T.R., Assistant Professor of Occupational Therapy. In March 1952 the School announced to the Executive Board of the Trustees two new courses, one leading to the Bachelor of Science in Medical Technology and the other to the Bachelor of Science in Radiological Technology.